You know when you were a kid and you used to pretend to be a princess or a Queen? Wasn’t it fun to imagine what your crown would be like? If I were a Queen and I had a crown I would want a cushion cut gem in every colour in rainbow order across the front. Wouldn’t it be awesome to have a big cushion cut gem of each colour? Well, I obviously do not have that but I do have a quilt full of gorgeous fabric cushion cut gems in every colour. Here it is! “Cushion Cut Quilt” pieced and quilted by Anita LaHay of Daydreams of Quilts. Pattern by Caroline Greco of Nightingale Quilts. I made the throw size and it is five feet wide by seven feet long. My husband is standing on a milk crate behind this quilt and it’s still lying on the grass at the bottom. Here’s another one with the cushion cut gem near the top of the block. I do love the Kona fabrics so much! As usual when I am taking quilt photos lately it was stormy and windy here. The quilt was flapping like a flag in the wind. It does make for good lighting though to get the colour to really pop. This is a great pattern and it’s not hard to make these blocks. I would say this pattern would be at a “confident beginner” level. I made three of each of the colours and was able to do so with a fat eighth of each of the three tones. I really enjoyed choosing the colours for each gem. I was on a tight time line as it took me a while to make up my mind what fabrics I was going to order. I wound up using a “Brights” and a “Classic” fat quarter bundle from Mad About Patchwork. I didn’t use all of the fabrics in the bundles but I needed a good variation of tones to choose from. Originally I was just going to use the brights but then I broke open the classics too which were on hand for another project. (I still have enough for that project though.) The awesome thing about Kona fabrics is they don’t go out of print! To save time and thread I chain pieced at every step of the way until I got to the final blocks and was ready to put the top together. The blocks themselves form the sashing which is wonderful for someone like me who really dislikes sashing. I used 8 strips from a jelly roll of Kona brights to make my rainbow binding. I really love how this quilt turned out! The “Cushion Cut Quilt” pattern will be available in Nightingale Quilt’s Craftsy shop. Click the follow button over there to ensure you don’t miss it! I think she might have another cool 3D design in the works too. 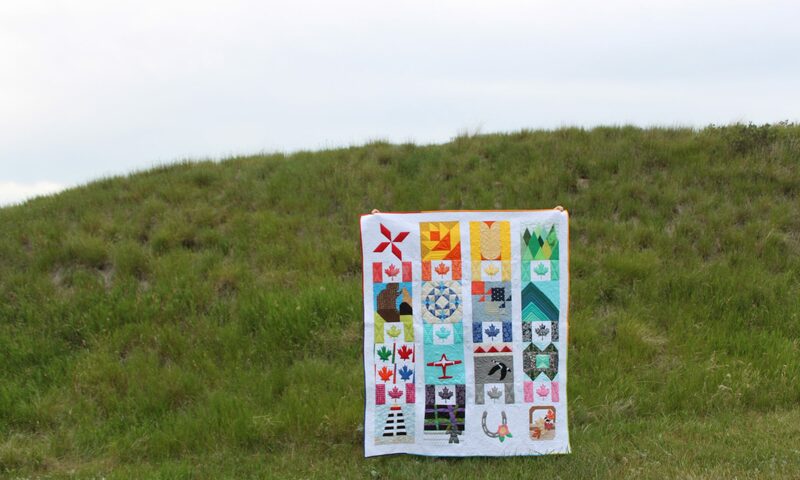 Please visit some of the other testers to see their versions of the quilt. You can also see even more in the hashtag #cushioncutquilt on Instagram. Sign up to my newsletter to get this fun free printable quilt planning page, a free pattern and more exclusive content! Linking up with “Finish It Up Friday“. I actually had this finished last Friday but waited to post today for Caroline’s Pattern release schedule. Very interesting and intriguing design! Not sure how I would duplicate this-probably with a rainbow of colors. Maybe fussy cutting a few centers of the blocks! This is a beautiful quilt….I'd say twin rather than throw. I love the mix of colors and the prints you added. They provide texture and interest to the quilt. I'm into brights and Kona fabrics just call my name so I think I'd find some of them and maybe mix with prints from stash. Thanks for the opportunity to win. I'd a rainbow fat eighth bundle I have that I've been searching for the right pattern for, I think this is it. I love your quilt. I would make mine with different colors as well. Thank you for sharing, and the giveaway. How about a rainbow version?? I love this pattern and the colors you've used are perfect! I'd love to try this! Wow! This is a gorgeous quilt and a clever pattern. Love the fabrics you chose, Anita! Congrats on a fabulous finish! Very clever pattern. I like the contrast, it stands out quite striking. I would give it a try. Addicted to sunset colors so it would be my night time sitting outside on the grass quilt in Oranges, corals, mustards, crimson, gold. Gems the same size and perhaps turquoise as my "gem" binding. Thank you Anita, it does add a cool and another dimension by flapping in the wind. What a beauty! Love all the color! Mine would for sure be full of color! Hmm…I'd have a hard time picking out fabrics for this one! I'd go with solids, and probably end up with the whole spectrum. It looks great, Anita. Vibrant and lots of dimension. Lovely design; great choice of fabrics! I'd probably make all the colors. I really love yours!